For other uses, see St. Pancras. St Pancras (/ˈpæŋkrəs/) is an area of Central and North West London. For many centuries the name was used for various officially designated areas, but it is now used mainly for the railway station and for upmarket venues in the immediate locality, having been largely superseded by other place names including Kings Cross and Somers Town. In the 1790s Earl Camden began to develop some fields to the north and west of the old church as Camden Town. 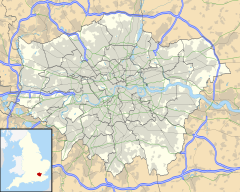 About the same time, a residential district was built to the south and east of the church, usually known as Somers Town. In 1822 the new church of St Pancras was dedicated as the parish church. The site was chosen on what was then called the New Road, now Euston Road, which had been built as London's first bypass, the M25 of its day. The two sites are about a kilometer apart. The new church is Grade I listed for its Greek Revival style; the old church was rebuilt in 1847. In the mid 19th century two major railway stations were built to the south of the Old Church, first King's Cross and later St Pancras. The new church is closer to Euston station. In the 1950s, St Pancras Council gained a reputation for left-wing radicalism, being referred to as "the most freakish borough in London. The council refused to take part in civil defence preparations for war, which local councils were obliged to provide. John Lawrence as Mayor was monitored by the Home Office and, as of 2016, the Home Office still refuses Freedom of Information requests relating to Lawrence on the grounds of protecting national security. Housing was in excess demand after the damage and disruption of the Second World War. There was strong opposition to the 1957 Rent Act, which led to a series of decisions that caused serious financial difficulty. John Lawrence and several other councillors were expelled from the Labour Party in 1958, but continued to serve as the Independent Socialists. The Conservative Party won the 1958 council election. In 1960, there was a widespread rent strike in the district, which led to rioting in September. During the 18th and 19th centuries, St Pancras was famous for its cemeteries: as well as the graveyard of Old St Pancras Church, it also contained the cemeteries of St James's Church, Piccadilly, St Giles in the Fields, St Andrew, Holborn, St. George's Church, Bloomsbury, and St George the Martyr, Holborn. These were all closed under the Extramural Interment Act in 1854; the parish was required to purchase land some distance away, and chose East Finchley for its new St Pancras Cemetery. The nearest London Underground stations are King's Cross St Pancras and Russell Square. The nearest National Rail stations are London King's Cross and St Pancras. ^ Mathieson, David (2016). Radical London in the 1950s. Stroud, UK: Amberley. p. 86. ISBN 9781445661032. ^ Mathieson, David (2016). Radical London in the 1950s. Stroud, UK: Amberley. p. 110. ISBN 9781445661032. ^ Mathieson, David (2016). Radical London in the 1950s. Stroud, UK: Amberley. p. 215. ISBN 9781445661032. ^ Mathieson, David (2016). Radical London in the 1950s. Stroud, UK: Amberley. p. 154. ISBN 9781445661032. ^ Mathieson, David (2016). Radical London in the 1950s. Stroud, UK: Amberley. p. 158. ISBN 9781445661032. ^ Mathieson, David (2016). Radical London in the 1950s. Stroud, UK: Amberley. p. 180. ISBN 9781445661032. ^ Hinson, Colin (2003). "St. Pancras". GENUKI: UK & Ireland Genealogy. Retrieved 25 February 2017. ^ "History". St Pancras International. HS1 Ltd. Retrieved 25 February 2017. 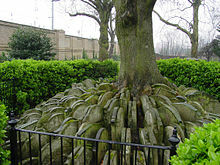 ^ a b "The Hardy Tree, St Pancras Churchyard, London". The Victorian Web. 17 April 2006. Retrieved 25 February 2017.